There was a way that could find you the cheapest product from your supplier without having to check individual prices from each supplier every time? There was a way that calculated all the discounts of products that you get from your main line wholesaler? There was a way that could save you over 15 hours per month so that you could focus on other services such as MUR, NMS, AUR e.t.c. There was a way that could integrate all your dispensary and shop floor orderings on one Web-based platform which you could access from any PC or laptop? Welcome to Drug Comparison - One of the most comprehensive online drug comparison website in the UK. It enables pharmacies to compare prices of Dispensary and Shop Floor lines from their suppliers on a single order screen panel efficiently and effortlessly. "Drug Comparison is an innovative software. I have yet to encounter something as simple and straightforward when it comes to ordering stock. It gives the latest price updates from different suppliers and also updates you when items are out of stock. It automatically refers the order without any hassle. Every Pharmacy should have this as it saves up a lot of time and money." "Drug Comparison is an excellent web based software that I believe any Pharmacy will benefit from! I work in a Pharmacy where we use multiple suppliers and shop around for our medicines and other products. Drug Comparison has made this process fast and simple by allowing me to compare suppliers' up to date prices on one screen and then order those products directly through the software. I have also found the software to be very resourceful with information like the Drug Tariff and NCSO and Price Concession information built in. The web transmission is brilliant with immediate replies on out of stocks and smart reordering. Not only has Drug Comparison made shopping around for products easy and efficient, but it has saved our Pharmacy alot of money by ensuring we are always getting the best deal available. My advice is try it!" "A great easy to use software which saves a lot of time and money. A must have for all pharmacies." "I have always received excellent service from the Drug Comparison team. Timing and quality have always met my expectations and everything is communicated in a professional and timely manner. It is a very user friendly software." "Drug Comparison - the find of 2015! From its robust and user friendly interface to its excellent and helpful customer service, it truly is the complete package. Finding the cheapest stock has never been easier and in a busy pharmacy like mine, those valuable minutes saved are worth every penny. I look forward to any further developments to the software. 5/5 for me!" "I have been working as a student dispenser for the past 4 years. One of the most time consuming part of the job was always ordering the stock, be it bulk or regular medicines. Drug Comparison has been of great assistance and after using it for just a few months, I have been greatly impressed by how simple it makes ordering and it also saves a lot of time and money. The user interface is very simple and the site never lets me down. They have a great team working round the clock to help with any assistance I require." "Time is an intangible cost factor in any pharmacy and every little of it that you save can be used to accomplish something else. One of the best features of this software is that it brings all the suppliers together on one order screen. No more hassle of opening 4 different windows." "Drug comparison has been a superb and easy to use software. All ordering on this software can be done on one screen which is very time efficient. It took away all the windows and tabs that we had open on the PC. The customer service is very friendly and responds very quickly. Always there and ready to help." "After using Drug Comparison, I have found that ordering the shop floor items is easier as it compares prices of all the reps and other suppliers that we use with the cheapest price. Items in the listing matches the correct description so there are less mistakes which also means saving a lot of time." "Drug comparison is an efficient and a well thought up software. As a dispenser, I find time taken to order stock and search for the best prices, takes a fraction of what it used to before. Time and money are therefore saved. This is a well worth investment and I highly recommend it to any pharmacy looking for a cost effective ordering system." offer its members the best prices every month. Members have access to an integrated dispensary and shop-floor ordering system, which saves members time and money. Drug Comparison - Offering members an exclusive deal! The Product Management Tool allows you to SET the maximum price you wish to pay for a product. This feature is extremely useful when you are ordering lines above Drug Tariff. 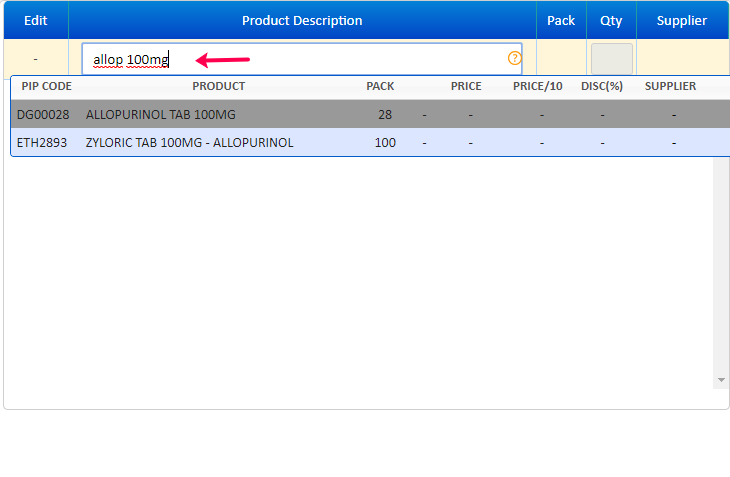 Example: If you set the maximum price of Allopurinol 100mg tablets at £2.00 per pack, then the software will order this product from all the suppliers (by price) automatically up to a maximum value of £2.00. If all the suppliers are out of stock under £2.00 then it will NOT automatically order from any suppliers above £2.00. The above settings can be made TEMPORARILY for an "active" order only or PERMANENTLY for all future orders. HOW TO SET A MAXIMUM PRICE ON A PRODUCT FOR AN ACTIVE / CURRENT ORDER ONLY! 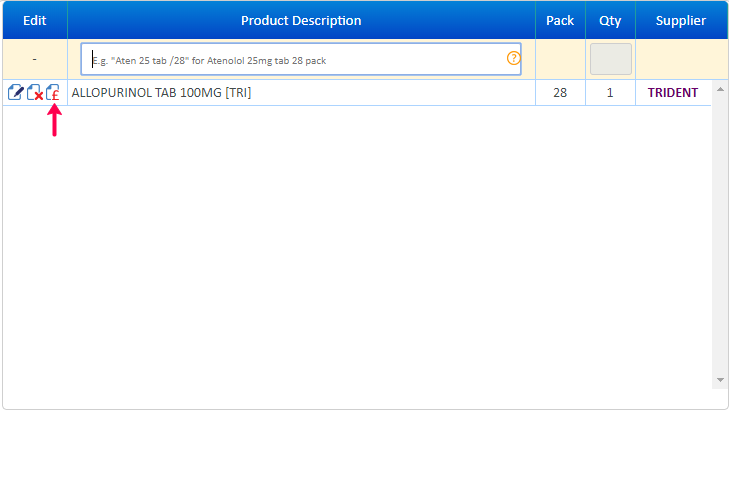 Search Allopurinol 100mg in the search box, select the cheapest product and enter the quantity you would like to order. Click on the “£” icon to open the Product Management Tool. Let’s say the maximum price you are willing to pay is £2.00. Enter the value 2.00 in the Maximum Price input box and thereafter Click on "UPDATE". You have now configured the maximum price of Allopurinol 100mg tabs x 28. If all the above suppliers are out of stock, then it will not order from Alliance at £6.50 as this is above the Maximum price value you have set for Allopurinol 100mg.